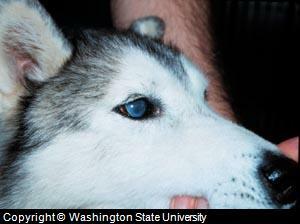 Surgery is one of various ways to treat dog eye problems. Specifically, it is used when the dog eye problem identified cannot be treated with the help of other common methods, including therapeutics, prevention or with supportive natural healing approaches. Canine eye surgery can be minor to major in nature, depending upon the cause, status and chronicity (severity) of any dog eye condition. 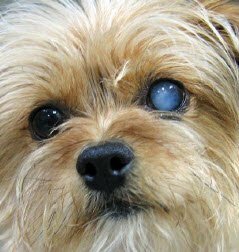 Dog eye surgery is commonly indicated for some anatomical deformities caused either by congenital problems (inherited), accidents, traumas or for chronic or severe conditions. Similarly, canine eye surgery is used to treat chronic and pathogenic (disease) dog eye problems which cause an alteration in normal eye function, including all chronic infestations and infections which penetrate the eye and cause progressive damage to the ophthalmic tissues and which cause a loss of dog eye function. Some specific conformational abnormalities such as dog eye entropion (inversion of lids), ectropion (everted eyelid margins), lagopthalmos (inability to close eyelids completely) and cilliary factors (the thickened part of the vascular tunic of the eye) requires minor to major canine eye surgery procedures for correction. Dog Eye and eyelid tumors, glaucoma, dog eye cataracts, lens detachments, tear drain blockages, and corneal ulcers are some specific dog eye conditions, which requires surgical assistance for healing. A veterinary surgeon should decide if a patient is “Most Suitable” for ophthalmic surgery. Certification is always required based on a thorough clinical examination, laboratory tests and the overall physiological status of the patient. All basic tests, including blood tests, protein tests and ophthalmic tests should be done before deciding if dog eye surgery is the best treatment approach. Additionally, medical preparations are usually required for major dog eye surgeries. Therapeutics such as corticosteroids, anti-bacterial agents and anti-inflammatory drugs are usually administered days before canine eye surgery to prevent miosis (excessive constriction of the eye pupil), protein release during surgery and to help to improve the efficacy or effectiveness of anesthesia used during surgery. Therefore, a dog owner should be aware of all the prerequisites required for ophthalmic surgery, i.e. he/she should cooperate with the attending team during diagnosis, soundness, monitoring and preoperative preparation. It has been noted that preoperative preparations can improve success rates up to 40% in dog eye surgery. Dog eye surgery is a general term used for ophthalmic surgeries, which are a spectrum of procedures chosen to treat different dog eye conditions. These can be minor to major in nature and the selection of a specific approach, procedure and time depends upon the overall condition, age and overall physiological soundness of a patient. Different dog eye surgeries such as flat ophthalmic surgery, cryosurgery, laser surgery, intraocular surgery, cataract surgery etc are some of the basic types of surgery usually selected for treating dog eye conditions. All of these types of dog eye surgeries are usually based on a concept of excision, correction, elimination, enucleation (dog eye removal), drainage or support. Since a dog eye is a delicate organ and surgical procedures are relatively more complicated, indicators for success are different than other types of surgery. In a major approach, a successful dog eye surgery is defined to be achievement of the primary goal, for which surgery is preferred. But, in case, the primary goal is unable to be achieved due to failure in earlier diagnostic procedures or in cases where there is a poor prognosis (expectation for success), the definition of success may change. This includes, either partial success in treating the dog eye condition or at least further progression of the condition is halted from causing damage to the patient. Similarly, complete recovery and success of dog eye surgery is crucially dependent upon post operative surgical care. A patient, who has undergone canine eye surgery needs rest, care and avoidance of certain factors, especially light and various components in the diet, which can trigger post operative complications such as immune mediated problems and degeneration. Usually, antibiotics, anti-inflammatory drugs, pain killers, corticosteroids and regular dog eye cleaning is prescribed along with administration of supportive supplements. 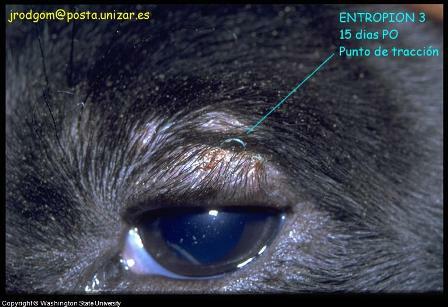 The patient should be regularly examined by a veterinary ophthalmologist who can monitor healing. Once the healing is either completed or remains safe, natural remedies, home care and herbal supplementation can help to improve overall eye health, eye immunity and progress. There are three suggested post operative natural dog eye remedies. These include Eye Heal, which is administered only after successful healing for dog eye health support, i-Clenz for safely cleaning the areas around the eyes (not for use inside the operated eye), and Immunity and Liver Support to enhance the immune system after surgery.